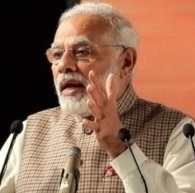 New Delhi, Feb 16 : Prime Minister Narendra Modi on Friday interacted with students from across the country over exams and said they should compete with themselves instead of competing with others. “You should compete with yourself. Stop competing with others and start competing with yourself,” Modi said in response to questions from students. The interactive session which is being held at Talkatora Stadium here, is called “Pariksha pe Charcha”. It has been organised days after the Prime Minister launched his book “Exam Warriors”, a collection of anecdotes from his growing up years.